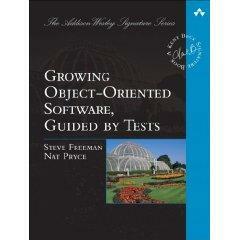 Steve and I have been working on a book for the last few months entitled Growing Object-Oriented Software, Guided by Tests. We're now at the stage where we can put content online to garner feedback. We'll post a chapter every week or so. Eventually, the book will appear as a Rough Cut on Safari. If you'd like to read and comment, please join the Yahoo group we've set up for discussion about the content. We'd love to hear what you think. Copyright © 2008 Nat Pryce. Posted 2008-07-25. Share it.